An excursion to Capri is always an unforgettable experience. Although a very small island, Capri is renowned worldwide for its natural beauty, the characteristics of its white houses, the gardens of villas nestled amidst the bright green of its slopes and for the transparency and the different colors of the waters that surround the island. 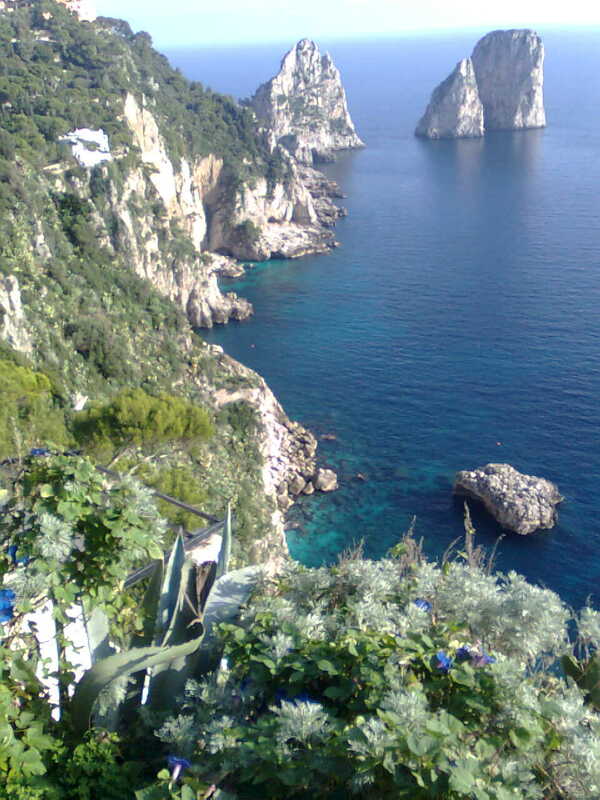 There are only two towns on this beautiful island: Capri and Anacapri. The town of Capri is characterized by a maze of narrow streets that climb up the slope of the mountain, and teeming with tourists almost all year round. From March to November the shops show the best products of the area, creating colorful spots that liven up the white walls of the city. The wide choice of places to visit in Capri makes you never get tired and go always looking for new things to see: the square, the historic center, the Augustus's Gardens, Villa Jovis, Tragara, the Certosa, the Cerio museum and so on. Perched on the slopes of Monte Solaro, the town of Anacapri, is different from Capri for the location of its houses scattered throughout the countryside, the historic center and the slopes towards the sea are full of beautiful villas. Along the streets of Anacapri too there is a continuous succession of shops that show all that man produces in this land. Almost all the narrow streets of Anacapri lead to terraces where you can enjoy breathtaking views of the Gulf of Naples or Salerno. A climb to the top of Monte Solaro by chair lift is an experience not to be missed, especially when the sky is clear, because the view from the top of Monte Solaro ranges from the Amalfi Coast to the Cilento coast on one side, and from Vesuvius to the mountains north of the plain around it, with a view of Naples, Misenum, Procida and Ischia. The visit of the island varies depending on the preferences of the guests. Those who love the sea can start with a tour of the island by motor boat, to see the beautiful caves of the southern coast, with Faraglioni rocks, all the way to the opposite side of the island to visit, weather permitting, the famous Blue Grotto. After the tour around the island they can rise to the city for lunch. Those who do not want to be on a boat all the time, they can start with a visit to the center of Capri, where a stop for a photo from the terrace of the funicular is a must. After a coffee in the famous and cheerful "square" Umberto I, short free time for a visit to the streets tingled with excited tourists and inhabitants. After lunch, the hike continues going up to Anacapri to admire the panorama from the terrace overlooking the sea and take some free time for a walk or, as an alternative, take the chair lift to reach the top of the Mountain for a breathtaking view of the two gulfs. After the visit of Anacapri, everybody will return to the port where, after a taste of the famous "limoncello", some free time for shopping will be given, before leaving the island and go back to the mainland. Please note that the trip takes several hours, so it would be preferable to stay overnight in the area (Naples or Sorrento), but it is also possible to come from Rome for a short visit, and enjoy the atmosphere of the island just adapting the tour to the time available.